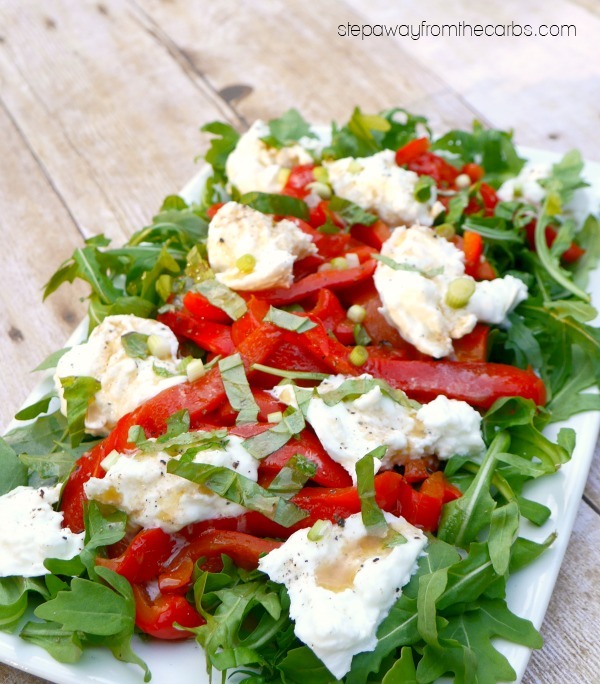 This red pepper and buffalo mozzarella salad is served with a delicious tangy dressing. 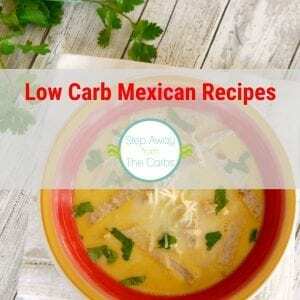 Low carb, keto, and gluten free recipe. Mozzarella is a confusing cheese. There are so many levels of quality that it almost needs different names. At the basic level there is the cheese that is used on pizzas and for string cheese. It’s very mild, and therefore often popular with kids. A step up from this are various kinds of mozzarella in balls. They could be one big ball maybe 3-4″ across, or little balls which are perfect for salads. They are softer with a different texture. At the top of the pile are balls of buffalo mozzarella. Although similar in appearance to regular mozzarella balls, buffalo mozzarella is much more flavorful. 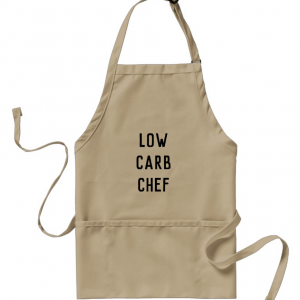 It is perfect for salads! 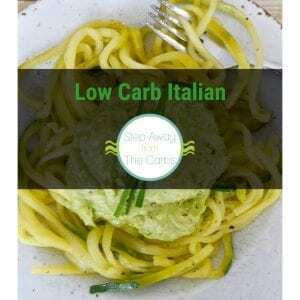 Note: Since writing this post I have discovered burrata – which is really worth trying and would also be great in this recipe!!! You can buy pre-roasted red peppers in jars, but for a salad like this where it is a focus, I prefer to roast my own. Plus, the jarred ones can be quite soggy! And actually I broil them, rather than roast them, but you can also char the skin over a gas flame like I did for the poblanos in Turkey Enchilada Stuffed Poblanos recipe. 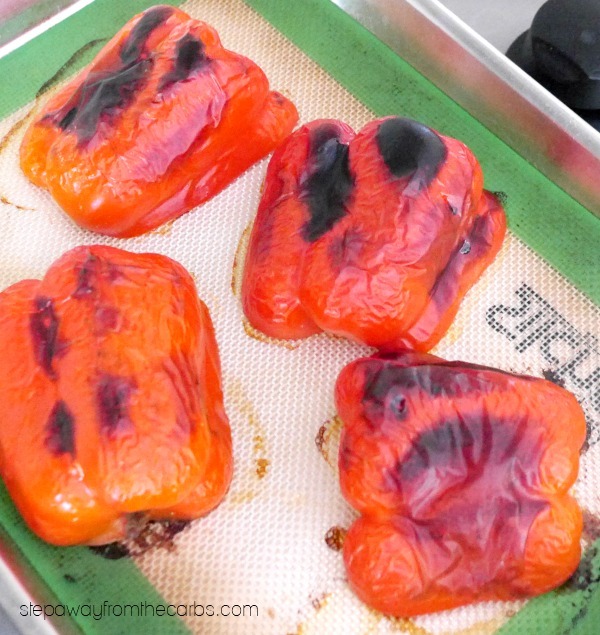 But if you’re going to broil them, cut the peppers in half, remove the seeds and stalk. 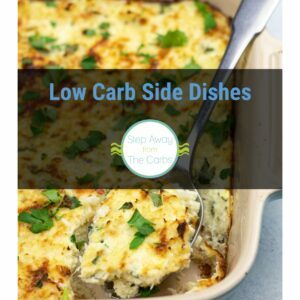 Place them cut-side down on a baking pan (I love this quarter-size pan that comes with a silicone mat!). Place under the broiler until the skin has blackened. Using tongs, put the peppers in a sealed plastic bag for five minutes. Remove from the bag and peel off the skin. You may need a knife for the edges. Cut the peppers into small strips. You can prepare the red peppers in advance, if that works better for you! 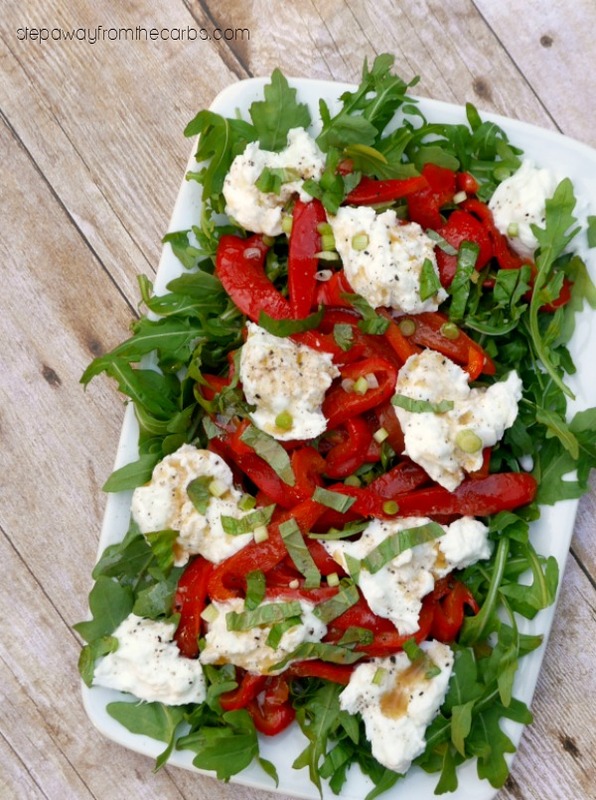 Construct the rest of the salad by adding arugula and the red peppers to a bowl or serving platter. Tear the buffalo mozzarella into pieces, and pat with a paper towel to remove excess moisture. Add them to the salad, together with the some sliced basil leaves and black pepper. To make the dressing, whisk together extra virgin olive oil, red wine vinegar, and anchovy paste. If you’re worried about the anchovy, don’t worry – the final result isn’t fishy at all! But even if you skip the paste, the dressing will still be good. Drizzle it over the salad and finish with some finely chopped green onions. 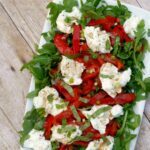 This salad features arugula, torn buffalo mozzarella, strips of roasted red pepper, and all finished with a tangy dressing. Place the red peppers on a baking pan cut side down. Broil until the skin has blackened. 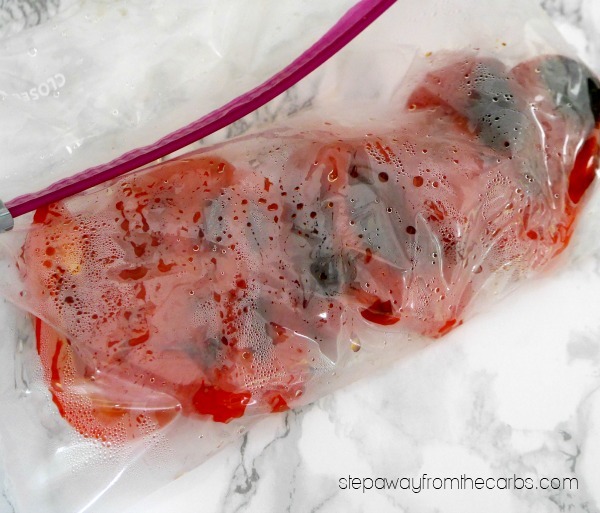 Place the peppers in a sealable plastic bag for 5 minutes. Remove from the bag. Peel off the skin and discard. Chop the peppers into small strips, and let cool. 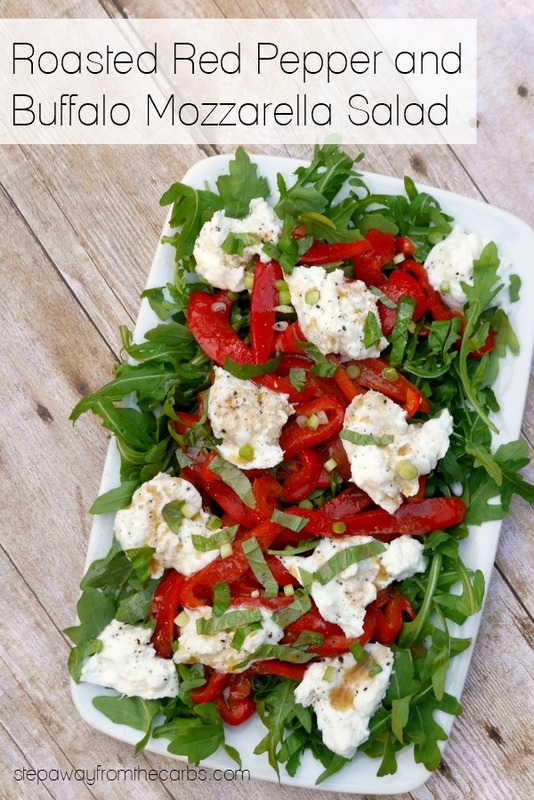 Add the arugula and peppers to a serving bowl. Tear the mozzarella up, pat with paper towels to absorb excess moisture. Add to the bowl, together with the sliced basil and black pepper. 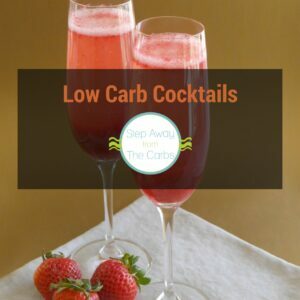 Whisk together the oil, vinegar, and anchovy paste, then drizzle it over the salad. Finish with the chopped green onions, and serve.